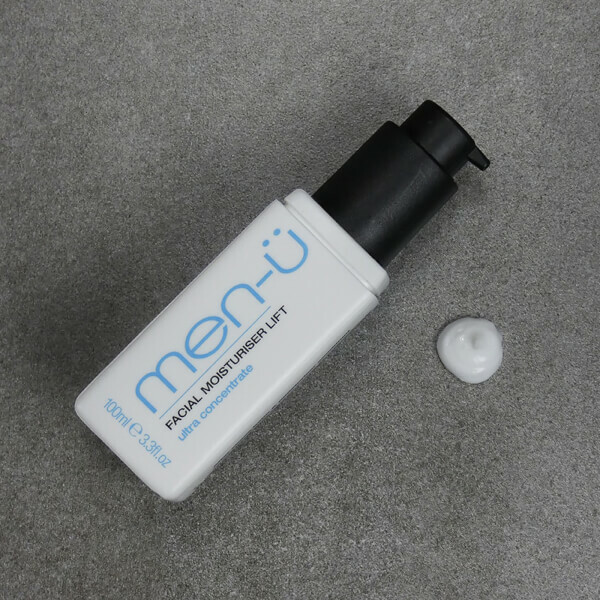 Replenish and refresh skin with the men-ü Facial Moisturiser Lift; a lightweight, non-greasy formula that delivers the benefits of an aftershave balm and hydrator in one bottle. Infused with cooling Mint and Menthol, the fast-absorbing moisturiser delivers long-lasting hydration, whilst soothing and relieving redness to leave skin feeling comfortable around the clock. Ideal after cleansing and shaving, you can expect super soft, smooth skin with a non-sticky finish. Ultra-concentrated for up to 165 applications. Perfect for waking up skin in the morning or for the evening ahead. Ideal for use after shaving and/or washing - rinse and pat dry with clean towel. Apply 1 to 1.5 shots between palms and apply to face and neck area. Aqua (Water), Paraffinum Liquidum (Mineral Oil), Cetyl Alcohol, Glyceryl Stearate, Palmitic Acid, Glycerin, Stearic Acid, PEG-30 Stearate, Dimethicone, Phenoxyethanol, Menthyl Lactate, Ethylhexyl Palmitate, Parfum (Fragrance), Tocopheryl Acetate, Caprylyl Glycol, Chlorphenesin, Menthol, Xanthan Gum, Aloe Barbadensis Leaf Juice, Sodium Lactate, Citric Acid, Limonene, Linalool, Butylphenyl Methylpropional, Hexyl Cinnamal, Sodium Hydroxide, Alpha-Isomethyl Ionone, Citronellol, Potassium Sorbate, Sodium Benzoate. Have used this product for a number of years now and has sorted out all of my facial dry skin issues. I, on occasion, get dry patches on my face either side of my nose (in the S-zone) - this does a great job of combating my skin's lack of moisture here. Recommended, particularly, as part of a post-shave routine. This is a fantastic product, sure I've tried others but I always come back to this. Never has such a small bottle packed such a punch. Not everything is for everyone, however, if I was I was given one choice this would be it. I put this on and I feel great (with all their products) and this is what I want if I'm going to put something on my skin. Based on the Men-u shaving cream which I find very good, I was hoping for more from this moisturiser but was left disappointed unfortunately. Would not recommend for dry skin as it doesn't moisturise as much as hoped or like e.g. Palmer's Cocoa Butter Formula Men's Lotion but which I find a little greasy. Still love the shaving cream though! Have been using for a couple of years now and my facial skin has never been better. Combined with a good moisturising blend to leave your skin feeling soft, leaves it feeling and tight and smells fresh with the menthol scent. Cant beat it! Overall this Facial Moisturiser Lift is good product, but for my skin is little to tinglish. Makes skin ultra smooth! Nice fresh feeling when used but not quite up to the dryness of my skin in a few problem areas. Absorbs really well and leaves no trace (other than a bit of refreshing tingling!). The best thing about this Facial Moisturiser Lift is definitely the value for your money. 100ml of face moisturiser for this price really goes a long way. The mint in this gives a real tingle but after you get used to it, it becomes really refreshing. Doesn't really work as an aftershave balm though! Personally, this is the best daily moisturiser I have ever tried. The mint and menthol combination is neither strong nor weak, but just right and lingers on the skin for the better part of an hour. The cooling sensation is wonderful and really brings relief to the skin after a warm shower. However, in my experience, I would not recommend it as an aftershave balm, unless you are prepared to use generous quantities of the product. It simply fails in the moisturising category where shaving is concerned. As a daily moisturiser it strikes the right balance for normal, sensitive and dry skin. Aftershave balms have to be MORE moisturising that daily moisturisers because the skin has been more traumatised as a result of shaving. This product fails for me in this area. In all, I truly recommend this product and would give it more than 5 stars if I could, but I would try a sample size before purchasing the bigger bottle - particularly if you want an all-in-one product. Excellent product and I use Facial Moisturiser Lift every day. Does what it says on the bottle. Really impressed with this Facial Moisturiser Lift 100ml, has a non overpowering menthol feeling. Similar to Tea Tree oil. Will recommend to friends and family. Best for quality, quantity and cost I've found yet! It's not hard to see after use why this is so highly acclaimed by critics across the board. I still can't get over how cheap it is and how much you get out of it compared to all the other brands I've used. It's half the price and far more quantity of the product than any other brand I know of. You really feel fresh and awake after applying and a real cooling sensation lasts after use. Can't recommend this enough and fail to see how any one can give it anything but top marks. I always purchase this moisturizer! Feels awesome and refreshing after the shower or shave and doesn't leave greasiness on the skin! Love all the Men U products! Excellent moisturiser...I've used many different ones and nothing has worked like this one has! I have quite dry skin and couldn't clear quite a dry patch on my chin until I tried this one. Was recommended to me and I'd definitely recommend. I bought the men-u value pack and i love all the products. The moisturizing lift does a great job after use with the refresh gel and other shaving products. I'm from Australia and its hard to find a moisturizer that works well all day, but the moisturizing lift gets my approval! Highly recommended.